Ambassadorial residences are exceptionally prestigious buildings and they play a crucial role in diplomacy. An array of important social events are hosted from Ambassadorial Residences and these are attended by some of the most influential and distinguished characters from around the world. It stands to reason that the image that these portray must be one of affluence and that everything down to the smallest detail must be perfect. After all, these buildings are merely a reflection of the country of which they represent. The interior design of Ambassadorial Residences is nothing short of breath-taking and has often been described as 3 dimensional works of art. It is for this reason that El Palacio Damasceno have been sought out by interior designers tasked with furnishing such opulent establishments. 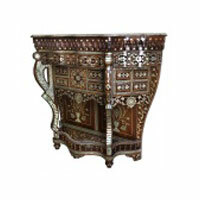 Our collection of traditional Syrian furniture is the first choice for interior designers looking for unique furniture that will flawlessly complement the interior design of Ambassadorial Residences. 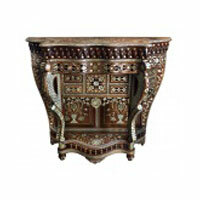 SALIHA is a floor standing corner table beautifully adorned with mother of pearl inlay, and carved by hand out of Walnut wood. 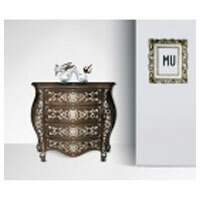 SALIHA comes equipped with four drawers for maximum storage capacity to hold your belongings and valuables. 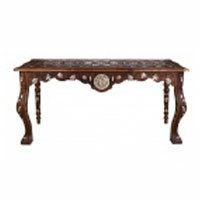 The pure walnut wood table is easy to fall in love with. 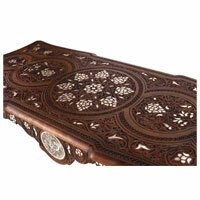 The Victorian era and Arab culture inspired table utilizes beautiful carving styles that are handmade. Even the minutest details have been catered with care. 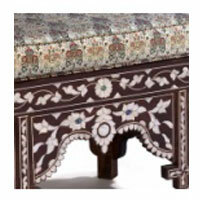 The carvings are encrusted with genuine Syrian mother of pearl and mosaic work. 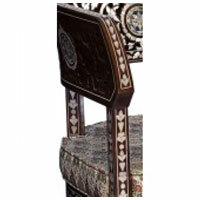 YASMIN is a chair styled exactly like the throne of kings of the past dynasties. 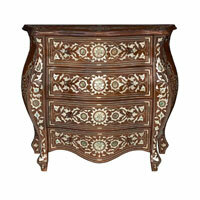 Handcrafted out of Walnut wood and inlaid with genuine Syrian mother of pearl, YASMIN captures the essence of both luxury and comfort.